Coping with Alzheimer’s disease is difficult for both the person affected as well as his or her loved ones. 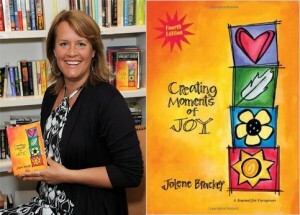 Jolene Brackey, author of Creating Moments of Joy and founder of Enhanced Moments, works to help families and senior care professionals handle the changes that Alzheimer’s and other forms of dementia bring. Jolene’s company, Enhanced Moments, offers various educational and inspirational resources for anyone touched by Alzheimer’s or another form of dementia. Enhanced Moments has been featured on Good Morning America and lauded for its message of looking beyond the challenges of the disease and refocusing energy on making joyful moments since people with short-term memory challenges do often live from moment to moment. Thus, rather than asking someone with Alzheimer’s what he had for breakfast (to which he may respond “what breakfast?”), the Enhanced Moments approach recommends asking the individual if he prefers toast or eggs for breakfast, as this pulls on the more accessible long-term memory in terms of taste preferences. You might also consider bringing something like a favorite food to share or an old photo to talk about together – something to trigger long-term memories and create positive feelings. but simplify, simplify, simplify until it’s EASY. We had the pleasure of asking Jolene some questions about her journey to becoming an expert on Alzheimer’s care. Q: You left a career in interior design to pursue a passion for caring for older adults with Alzheimer’s. What qualities do you think enabled you to find fulfillment and joy in this position? What qualities have you seen in caregivers (both family and professional) that are able to balance duties and prevent burnout? An important quality is to be an observer instead of a fixer. When I observe and allow people to be as they are, there is more harmony. Caregivers who are able to find balance are ones who take things lightly, not personally. If no one is physically getting hurt, then let it go. Unfortunately when a caregiver has history with the person they are caring for, there are triggers that cause suffering for both parties. Thus, it is sometimes better to have a caregiver who doesn’t know the person well as they are more likely able to allow the person to be as they are through the changes of this disease. Q: Your focus is on “moments” of joy – what do you think that shifting the focus from long-term goals to simple moments when caring for adults with Alzheimer’s allows? Moment by moment presence is a life lesson that I believe they [the adults for whom caregivers care] are here to teach us to practice. With Alzheimer’s, there is no planning, no figuring it out; if a caregiver tries to figure out what is going to happen next that in itself is insanity. The only thing that is predictable is that it is unpredictable. Q: If you could summarize what you’ve learned over the years into three key tips, what would they be? When you allow the person and yourself to feel what you are feeling, there can be a tremendous amount of healing. So cry, get angry, scream, laugh and pause in a peaceful moment. Express yourself on this journey and allow the person who you are caring for to express himself/herself. This too shall pass into another moment. Q: Do you have a favorite caregiving story to share? My favorite part of any interaction is simply smiling and giggling. Rarely do people understand if I talk but when I smile and giggle and rub their backs, the world goes away for a moment. For more information on Jolene and her work visit http://enhancedmoments.com/.